At the Jacksonville Center in Floyd, 71 works of art by 32 different artists have just been mounted in the Hayloft Gallery. This exhibit is called The Canopy of Trees and the works are either made of wood, have trees as a subject, or are in reference to trees. The quality and variety of work is already producing rave reviews from visitors. 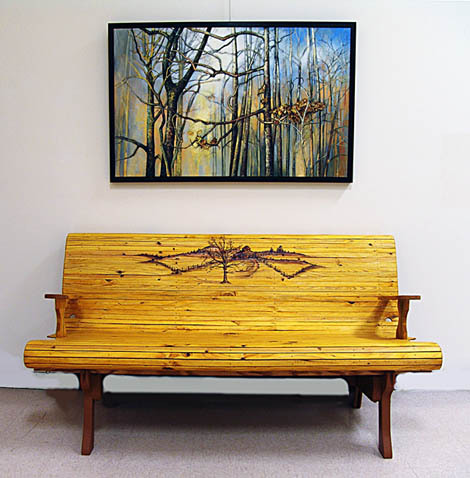 I had a chance to visit the gallery for a few minutes last week when the committee was setting up the exhibit and I took this photograph of Ron Campbell’s "Country Porch Swing" under Adele Wayman’s "Winter Trees". The exhibit will be running until November 25, so you will have a chance to see what these 32 artists have conceived. On the other hand, if you want to meet the artists themselves, you need to come on down to the Jacksonville Center tonight and join in the fun at the Artists Reception which starts at 6pm and runs to 8pm. Refreshments will be served and a good time will be had by all. These "Meet the Artist" receptions are attracting more people each time we hold them. The receptions are a great way to meet the movers and shakers of the Floyd art world. You can make some artist’s day by buying their work. Everybody likes to see a "sold" sticker on pieces in an exhibition. There is also a ballot for selecting the work you like the most. You fill out your ballot and put it in the milk can ballot box.At the end of the exhibition in November, the work that gets the highest number of votes is awarded a $50 prize for being the popular favorite. When you have toured the gallery and met all of the artists, you will still have time to drive down the hill for the Friday Night Jamboree at the Country Store and a latte, coffee or a glass of wine at the Cafe Del Sol. 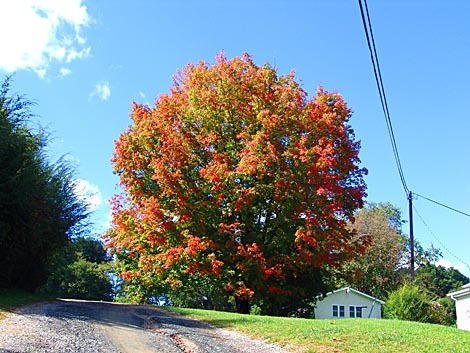 Fall foliage is already beginning to show in Floyd. Maybe we will see you this weekend! 0 Responses to It’s Party Time Again! Picture on top is great!!! The picture on the top is great art. Was fortunate to be led to your blog while searching for Tuggle’s Gap restaurant which we fell upon one fall Sunday and left with wonderful greasy hands and mouth, thanks to thier fried chicken. Being a Tarheel and living in LA for a year on business, I too have experienced withdrawal from not having my late night In-N-Out-Burger, half wrapped ready for the PCH and Topanga Canyon drive. Enjoyed In N Out recently in Phoenix, but not the same as the purist drive-in only spots in LA.